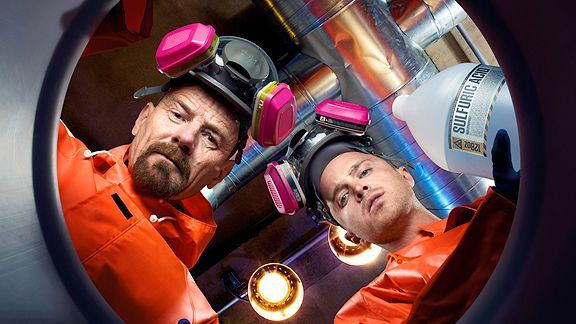 Breaking Bad is (allegedly) one of the best shows on TV. I say allegedly because I haven’t seen it. My TV watching habits are pretty strange: I don’t watch drama on TV. I watch scripted comedy (Community, Modern Family) and reality (Top Chef, Project Runway) and a couple studio comedies (The Colbert Report, Conan). I don’t watch anything serious on television, except the Friday analysis of Shields and Brooks on the PBS Newshour. I’ve been told I’m wrong a hundred times, and told I’m missing out a thousand, but I think I just can’t believe that great dramatic writers, actors, and directors are working on TV. I mean, if they were so great, wouldn’t they be making movies? You don’t see Charlie Kaufman-scripted, Ridley Scott-directed, Daniel Day-Lewis-starring television shows. The shows most referenced by people who tell me I’m wrong are The Sopranos, The Wire, Mad Men, and Breaking Bad. These are supposed to be the creme de la creme of recent television drama. But I don’t want to talk about their quality today. Today I want to talk about an article written about these shows by a favorite writer of mine: Chuck Klosterman. In his article, Klosterman argues that Breaking Bad is the best of these shows, because it is the only one which “is not a situation in which the characters’ morality is static or contradictory or colored by the time frame; instead, it suggests that morality is continually a personal choice.” He implicity criticizes Mad Men for enabling viewers to dismiss the bad things done by its characters as “just how it was back then” because the show is set in the 1960s. He similarly levels critiques at The Sopranos and The Wire for filtering all “good” deeds through the filter of everyone on the show’s being involved in the mob, or being drug dealers and/or corrupt, respectively. “I know my transgressions, and my sin is always before me. Against you, you only, have I sinned and done what is evil in your sight; so you are right in your verdict and justified when you judge. Surely I was sinful at birth, sinful from the time my mother conceived me” (Psalm 51:3-5). So is Breaking Bad the best show on TV because of it’s courageous depiction of human beings as free agents, able to choose between right and wrong? Or is Klosterman crazy? I’d answer these questions myself, but there was a Mythbusters marathon on, and I missed Breaking Bad all together. I just love this show, although the brutality makes me wince every once in a while. 1. Yes, Nick, you are definitely missing out on a lot of stuff that I bet you’d love. But I also have a feeling that if all the articles I/we’ve posted on here haven’t convinced you of the brilliance (and creative possibilties) of broad-canvas dramatic television, cable or otherwise, then this comment certainly won’t. 2. Not sure I’d say Klosterman is 100% wrong, but he’s definitely not 100% right. In fact, he sort of answers his own questions. The moral decisions in Breaking Bad (and in life) often feel like choices, but as Klosterman notes, Walt chooses the darker path, pretty much without exception. That is, every time it looks like he’s had a choice as to whether to get out of the biz, he’s “chosen” to do “one last cook,” etc. That’s what makes it realistic. Plus, his decision to get into the meth racket wasn’t remotely a “free” best-of-all-possible-worlds decision – at least not if you don’t consider a man’s desperate response to terminal illness such. If anything Breaking Bad illustrates the uniformity of the human condition, that the world isn’t divided into “good” and “bad” people – but that everyone has both inside them, and given the right circumstances… there but for the grace of god go I, etc. bottom line is, you should watch it. With each episode, I am still surprised about the insight into human motivation and desire that this show so skillfully depicts. A man appears to break “the law” by becoming a drug dealer in order to provide for his family after he passes away from a terminal illness. But the first episode shows that Walt is already dead. He’s bored, uninspired; a middle-aged has-been who’s missed out on glorious business opportunities to end up teaching a sea of apathetic high school students. He subconsciously WANTS to make meth, because he knows that it’s not only an escape from an “American Beauty” suburban-hell, but also that he’ll be really GOOD at it. In regards to the above article, I’m reminded of a quote from St. Augustine: “the free will without grace has the power to do nothing but sin”. 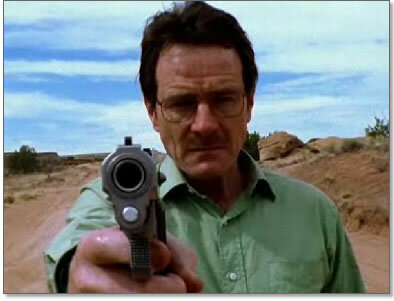 The real sadness of Walt’s situation (or ours), is that there is simply no good choice. Happiness is not found in being a good (or the best) meth cooker, any more than in being a trophy husband or father. One of my favorite scenes thus far has been one in the which Jesse comes out of rehab after his girlfriend dies and talks to Walt for the first time. He tells Walt that he is okay now because he has accepted who he is. “I’m a bad guy”, he says. Walter’s face tells all. Not him: not Walter White. He’s made some bad choices, yes. People are dead because of him. But he’s just in a slump. He’s going to try his damnedest to fix up his mess. The genius of this show is its unflinching examination of what it takes to make a “good person” bad, or a “bad person” good. I was, therefore, a little surprised when I read Vince Gilligan’s words (here on Mockingbird) about karma. This show is so much deeper, more complex, than that. Despite this fact, he is creating a picture of life that is honest, compelling and beautiful to watch. His multi-dimensional characters experience the desperation of the fact that we are all, in one way or another, breaking bad. “When Luther spoke of humankind’s hopeless abandonment to sin, he was for from envisaging mankind as a band of criminals. No, but the worst thing was the fact that we human beings fee l insulted when we are called sinners and that we appear to be far too respectable in our own sight to require repentance. Anthony, these are wonderful quotes! they remind me of K. Holl.